It seems like everyone you know is getting married and you want to make your wedding special and one of a kind. Themed weddings are the perfect way to create an occasion that reflects you and your fiancée’s shared hobbies, interests, or passions. From invites to the altar to centerpieces to the menu, anything and everything can be created to match your dream theme. Did you meet at a library and love books? Then have a literary themed wedding! Share a passion for traveling? Go crazy decorating with maps and globes! Themed weddings are fun, creative, and make amazing memories for you and your guests. You can always choose to go as wild in the details as you would like, or add subtle accents to suit your comfort level. Whatever you choose, make sure to share your pictures with us! 1. Vintage weddings are my personal favorite right now! This is an excellent theme to go all out with the details, or add a few subtle hints of vintage here and there to suit your comfort level. You can decide to have your wedding in a venue that means something to you and your groom, like Ben and Kelly did, and add as many vintage details as your heart desires. A few simple ideas are including pearls and lace, upcycling old chairs, doors, teacups, glassware, and books! You can use soft lighting, incorporate barn wood, and have fun with the props in your photo booth. And for the bridesmaids, the romantic delicacy of lace will not only make them look gorgeous in their Kennedy Blue lace dresses, but they will also match the vintage vibe. If you are looking for more vintage decor ideas, click here to see our blog post! 2. Astronomy. “I love you to the Moon and back” can be more than just a cute phrase if you decide to go for an astronomy themed wedding. Romantic star-like lighting, galactic cake toppers, reception tables named after different constellations, and moon backdrops for your pictures are just a few examples of things to do for your stellar wedding. Choose meteorite wedding bands or a planet design in your wedding rings, or decorate you and your bridal party's accessories with stars (each bridesmaid could even wear their own astrological sign!) It's your night! 3. Barnyad Chic. Inspired by rustic places and a neutral color palette, barnyard chic weddings are beautiful and romantic. A versatile idea that can work for either indoor and outdoor weddings, you can have a lot of fun choosing your venue! You can add simple touches to your wedding like wood, florals, string lighting, and chalkboards. When it comes to your bridesmaids’ dresses, you can complement your theme and palette with mint, peach, blush, sage, or slate blue dresses. These colors are soft and easy to fit into your wedding palette! 4. Beach weddings are perfect for a number of reasons: the beach provides a perfect backdrop for your big day so you don't have to spend as much on decorations, the venue is fun and unique, your guests will love being on the sand, and you can have fun with you and your bridesmaid's dresses! Regarding your hair, you could choose a simple braid and have it adorned with small flowers or ocean related pins, or consider a flower crown. Your makeup could be soft and natural. Let’s talk about décor! The possibilities include scattered seashells, paper lanterns, sparklers, fun cake toppers, starfish on the invitations, creative centerpieces with shells and sand, and decorating any surrounding trees with string lighting! You can decorate with paper planes, a map of the place where you met, pictures of your favorite cities or your hometowns, or have your guests sign a globe as the guest book! If you have guests traveling from out-of-town, create a map that shows where your guests traveled from for a fun way to acknowledge them! 6. Jungle, forest, or nature. From classical to edgy a nature theme is as limitless as your imagination! You can choose to have an outdoor wedding in a garden or arboretum, or have the mountains as your backdrop to really celebrate your love for the outdoors. Take a subtle route by adding flowers and wood to the centerpieces, or go a little edgier with moderate animal prints and leafy flower crowns for a jungle theme. You can give out potted succulents as a fun wedding favor! For your dresses, sage is a gorgeous green color to complement the outdoors! You can also use the bridesmaid gowns more like accents by choosing blush, mint, royal, or violet. 7. Underwater. You may have seen wedding pictures before where the bride and groom are literally married underwater! While getting married with fish and sharks is cool, you don't have to take the underwater theme quite so seriously. See if there are any aquariums in your area that will accommodate for a reception for a truly unique wedding that your guests will never forget! Otherwise, underwater themed weddings are easy enough to convey through your decorations such as sea shells, star fish and other sea animals, sand, and a blue cake! You can have fun with your wedding favors and give bubbles or flip flops. Mint, royal blue, slate blue, marine, and teal are all great options for your bridesmaid dresses! 8. Chic Parisian. What better city to incorporate into your wedding than the City of Love? If you’re an enthusiast of French culture and fashion, you might consider adding a few French details to your big day. You could have a romantic celebration in the countryside with a simple, bohemian style wedding dress that will show your chic and sophisticated side. Serve french finger food and macarons, decorate with soft lighting, incorporate vintage details, and create an Eiffel Tower for your photos. Black, white, and blush pink are beautiful colors for your palette! French brides usually wear little makeup and fix their hair in a braid or a simple hairdo adorned with a flower crown. Your bridesmaids might want to follow the no-hassle approach and go for a cute dress like Poppy. 9. Nautical. Set sail into your married life with a nautical themed wedding! Kennedy Blue has seen a lot of nautical themed weddings, especially with our variety of beautiful navy blue bridesmaid dresses like Harper or Charlotte! Take pictures by the water, scatter seashells on the reception tables, have guests leave you a "message in a bottle," use a large oar as a guest book, or have seafood appetizers. Nautical weddings are perfect in outdoor venues, and you can have lots of fun with decor details and wedding favors! Check out Lizzy and Logan’s wedding: they were super creative and cute with their nautical wedding decor details (like taking pictures on a boat!) and chose navy blue lace bridesmaid dresses! 10. Bohemian. Celebrate the happiest day of your life with a relaxed, nature-loving bohemian wedding that perfectly reflects your personality! Combine beautiful vintage and natural elements in both your look and in decor around the ceremony venue. Decorate with florals, barn wood, wreaths, lanterns, soft string lighting, and flowy fabrics. Looking for bridesmaid dresses to complement your theme? Check out Kennedy Blue styles Thea or Everly! 11. Rustic. You may hear the term rustic and picture an outdated theme that isn't modern or nice enough for your wedding, but think again! Rustic themes are romantic and elegant, and can be perfect for your wedding. Make your own lace wrapped bouquets, DIY chalkboard or wooden signs, and mason jar centerpieces or mason jar glasses for your guests! Decorate with soft string lighting, plenty of florals, lanterns, and wood elements! 12. Geo-Themed! Did you and your groom grow up in the same home state? Move to a new state together? Have a favorite vacation destination? Then consider having your wedding themed around your state (or city or country)! Your venue, decorations, cake topper, centerpieces, invites, and other accents can all celebrate your beautiful heritage or home. Have a gorgeous desert backdrop for your Arizona-themed wedding, a peach-related Georgia theme, or a Texan cowboy adventure. Just define what makes your loved state unique and follow that central idea! 13. Fairytale. Once upon a time… a beautiful wedding took place! A ceremony in a romantic garden with lights strung between trees and petals in the aisle is the perfect setting for a fairytale wedding. Arrive to the ceremony in a horse drawn carriage for a special surprise everyone will be sure to remember. Close out the night with fireworks, and don't forget to give your guests sparklers! 14. Masquerade weddings are surprising, fun, and unforgettable! Your guests will love dressing up in their masquerade masks, which will create cute pictures and memories. Not only will the masks be fun for guests, but just imagine the "first look" with your husband when you are wearing masquerade masks! 15. Seasons. No matter if you’re getting married in autumn or spring, a seasons themed wedding is a great option! Draw inspiration from your natural surroundings and decorate with leaves and apples for fall, snowflakes and elegant white trees for winter, and pastels and flowers for spring. This is a theme that is easy to go crazy with or add a few details here and there to suit your comfort level. 16. Disney. Ever wanted to attend a party in the world of Alice in Wonderland? Or under the sea like the Little Mermaid? Well, you can have a Disney themed wedding that will be sure to make Cinderella and Belle totally jealous! A Disney theme is so much fun because you can be very creative. Have each of your bridesmaids dress like a different Disney Princess, or have your groom look like Prince Charming! Decorate by incorporating Disney characters into the table centerpieces, have a Disney castle themed cake, or take pictures with Mickey Mouse ears. Bring along your animal sidekick, and don't forget your tiara! 17. Black & White. Perhaps the most elegant and sophisticated combination of colors is black and white. For a glamorous wedding (that doesn't have to be expensive), a black and white theme is perfect. Your invitations, table settings, food, bouquets, bridesmaid gowns, and everything in between can be fit into this theme! 18. Gatsby. I have one word: headpieces! The Gatsby theme is such a fun way to create a one of a kind wedding for you and your guests. Start with classy gold and black invitations and incorporate lace, pearls, gold accents, and feathers. Take pictures with vintage cars, use F. Scott Fitzgerald quotes, and go wild with your photo booth props! Kennedy Blue bridesmaid gown Ariel is a gorgeous sequin dress that is perfect for a Gatsby wedding! 19. Greek Mythology. Transport your guests back in time and welcome them to a celebration in Ancient Greece! Greek mythology and culture is very rich, so you and your groom have a lot of options in your planning. Incorporate sculptures, columns, gold sandals, golden accessories, and olive branches. You can even create a gorgeous altar out of olive branches and golden fabric. 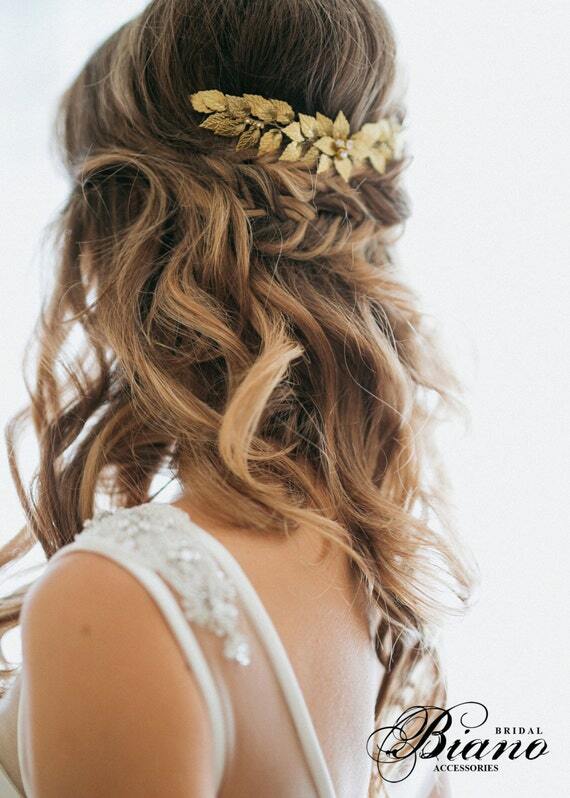 Place a gold headband or an olive leaf wreath in your hair to truly feel like a goddess! 20. Literary. Bonded over books? Then an adorable literary themed wedding is for you! Choose a particular book or series to center your wedding around, or have a general book theme. You could consider having books as your guest favors, or maybe you can recycle old pages into bouquets or hanging decorations. Incorporate your favorite quotes into centerpieces, wooden signs, or even your vows. The options are as endless as your imagination! This couple used stacked books as their centerpieces and recycled book pages for the flowers in their bouquets! 22. Music. This is a great wedding theme that you can really make your own! You can go with more of a music festival feel or make it about a specific record or artist you love! Incorporate different musical instruments into your decorations, hire a live band, or even play something for your guests! 23. Rock n' Roll. Travel back to a better time and celebrate your wedding rock n' roll style! Pick your favorite era or element of the theme and run with it. Long skirts, vintage cars, leather jackets, electric guitars, records, temporary tattoos, skulls, or vintage furs are all possibilities! 24. Favorite movie/book. If it's Harry Potter, Game of Thrones, Doctor Who, Star Wars, or anything in between, plan your wedding around your favorite movie, TV show, or book series! If you and your groom share a similar passion for a series, then why not? Take the most meaningful elements (like the Doctor’s TARDIS or lightsabers from Star Wars) and include them everywhere! Invitations, DIY photo booths, table settings and even yours and your groom attire can set the mood for a wedding that will be a sure hit! 25. Minimalist. Sometimes less is more, even in your wedding. A minimalist themed wedding will play with contrasts and use of space like no other. This principle can be incorporated into the invitations, reception, ceremony, table setting, and many other elements. For your wedding dress you can choose an informal dress that is cheaper than a traditional gown, but still very elegant. Doesn't everyone want their wedding to be truly unforgettable? While you may not want to be married underwater or in a Disney princess dress, themed weddings can be as subtle or obvious as you choose. Adding a few elements here and there to express you and your fiancee's common interests can be a fun way to show off your personality and create lasting memories for your guests. Have you ever attended a themed wedding or seen any amazing ones online? Would you want to be married on the beach or with a masquerade mask? Share with us in the comment section below! I want to do 14 the masquerade so bad but my fiance is having no parts of it. My fiance and I are still trying to come up with a theme that we both agree on. He wants a Pantera or AC/DC themed wedding (not sure if it’s a running joke) and I want more of a nature/ bohemian theme. I really love how you added extra themes that other wedding blogs fail to include AND you went the extra mile by explaining them. Thank you so much!! I love the idea of the literary theme! I would’ve never thought of that as a wedding theme yet it’s perfect since it’s something elegant and fun at the same time without being too unusual. I’ve never seen the astronomy idea. So cute! My wedding is a Spring Carnival theme based in the Countryside of Midlands, South Africa.